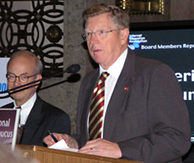 Senator Conrad Burns (right) introduces the Tech Fair with Congressman Rick Boucher (left). This years Internet Caucus Advisory Committee Tech Fair demonstrated technologies currently debated in Congress and impacting citizens lives. The 9th Annual Internet Caucus Advisory Committee Tech Fair (ICAC), held February 8, 2006 in the Dirksen Senate Office Building in Washington D.C., highlighted products and technologies relevant to key policy issues faced by the 109th Congress. Hosted in conjunction with the Internet Caucus State of the Net Conference, over 400 industry professionals and legislators examined current innovations in online security and privacy, child safety, copyright protection, VoIP, RFID, wireless, media convergence and Internet architecture. Attendees were welcomed to the event by Congressional Internet Caucus co-chairs Senators Conrad Burns (R-MT) and Patrick Leahy (D-VT), and Representatives Rick Boucher (D-VA) and Bob Goodlatte (R-VA). The extension of e-commerce to wireless devices, such as DoCoMos cell phones with e-wallet functions, highlight the need for secure online transactions. Keeping online information secure yet easily available to appropriate users is an ongoing challenge. To address this issue, the ICAC Tech Fair featured numerous security and privacy-related products. The latest computer virus attacks are exhibiting the ability to bypass even fully updated operating systems equipped with the latest virus and spyware-protected firewalls. Hackers use a variety of injection techniques to become part of allowed processes and thus bypass the implemented security mechanisms. One example shown at the Tech Fair was Symantecs Confidence Online, which targets these illegal entries by analyzing processor activity and looking for crimeware behavior. The software identifies threats such as worms, viruses, Trojan horses, keystroke loggers and phishing. It scans the computer for exploitive code, and once found, shuts off unwanted entry and related activities before the hack can do damage. Another important security related issue for citizens is the safety of online transactions. Visa showed Verified by Visa, which adds additional protection for online consumers by requiring a password to confirm a credit card holders identity. The service requires individual e-commerce sites to implement the feature, and consumers can choose their own passwords. Also discussed at the Tech Fair were improved methods of protecting corporate computer networks. An approach presented by Verisign was its Unified Authentication Tokens. The system uses physical devices resembling USB thumb drives to carry user authentication data. Like a car key, the user must insert the token into a terminal before accessing a secure network. The tokens also include LCD windows that are used to display one-time passwords. The devices can be employed for portable, encrypted data storage, as well. This feature is especially useful in transferring sensitive information such as medical, financial or employee records. 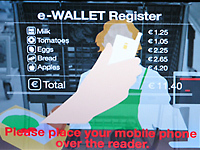 IBIDENTIFY: a server-based biometric logon captures images for fingerscan input technology. Identity theft and protection of personal information has led to an increasing use of biometrics for identity verification. Legislators and industry professionals at the Tech Fair viewed several types of biometric authentication. One of these was Integrated Biometrics Light Emitting Sensing (LES) technology, which captures forensic-quality, 650 dpi images of finger prints. The device shown at the Tech Fair has proved immune to electrostatic discharge, nicotine and issues on over a million touches, and accomodates dry, wet or slick fingers. The LES technology verifies that the finger being scanned is alive, and can compare it to as many as 10,000 records in less than one second. Fujitsu showed PalmSecure, a palm-vein based authentication system that captures a hands vein pattern image by radiating it with near-infrared light. The deoxidized hemoglobin in the veins absorb these rays, reducing their reflection and thereby creating a black pattern. This detailed vein pattern is compared to a pre-registered record and used to verify identity. Because veins are internal with many unique differentiating features, it is difficult to forge a false identity. Fujitsu reported that even identical twins can be distinguished with the system. DoCoMo's P901iS uses face/finger authentication. This kind of biometric technology is becoming increasingly common in Japan. Vein-recognition technology is already used there to access ATM accounts, and as wireless e-commerce becomes available, biometric identification is even offered on cell phones. DoCoMo showed its FOMA smart phones, which use fingerscans and facial recognition for wireless security. On some models, the phones owner uses its built-in camera to take a facial photo that is stored in the handsets memory. On other units, a fingerscan is registered. To verify identity during subsequent transactions, the phones camera or finger scanner is again used to compare the users current image to the stored record. If biometric criteria such as fingerprint or facial outline and eyes/nose position match, a password is then required for additional security. If a phone is stolen, the owner can dial the phones number, letting it ring a preset number of times to lock the phones buttons and e-commerce features. Some parents find that playing computer games with their children brings their family closer together. While the Internet provides educational and recreational resources for children, it has also opened a doorway of unprotected contact with potentially inappropriate material or predatory behavior. Parents can provide guidance to safeguard their children just as they would within their physical community, but they need the support of online tools to enable guidelines and laws to enforce protection. Presently, a bill known as the Internet Safety and Child Protection Act of 2005 is under consideration by the U.S. Congress. Several businesses at the Tech Fair presented new features improving child online safety. Microsoft demonstrated new parental controls built into the Internet Explorer 7 web browser and the Windows Vista operating system. To help keep children safe while on the Internet, parents can control what websites and games their children use. Multiple rating systems are available, and parents can select one they trust. Details of a childs browsing behavior can be viewed and such history can only be deleted with a password. Online browsing also can be limited to a specific number of hours or time of day. Child safety is also a concern in the fast-growing gaming industry. According to a national survey conducted by Peter D. Hart Research Associates in November 2005, 85% of U.S. voters with children (gamers and non-gamers themselves) say that they, not government, retailers or game publishers, should take the most responsibility in monitoring childrens exposure to games that may have inappropriate content for minors. To do this, parents need to able to find child-appropriate games without having to personally review each one. Attendees at the Tech Fair viewed some of the current media industry guidelines and standards. One of these was the Entertainment Software Association (ESA) Rating Boards content guidelines for video, DVD and computer games. These ratings make it easier for parents to filter and find appropriate content for their children. Legislators attending the Tech Fair commented that they did not foresee todays media convergence when the Telecom Act of 1996 was passed. Now that telephony, television and more can all share the same IP data streams, how should the marketplace be regulated? Congress is challenged with balancing the needs of consumers, service providers, broadcasters and content developers, as well as determining if traditional regulatory policies can apply to the Internets open environment. One of these convergent technologies is Internet Protocol Television (IPTV) where live television broadcasts and video-on-demand are accessed over broadband networks. IPTV is different from television over the Internet such as website services by Google or Yahoo. IPTV is a real-time multichannel service, similar to cable and satellite television, where users can choose from hundreds of channels. It uses Internet Protocol (IP) but is not delivered over the public Internet. Instead it uses a dedicated broadband multimegabit network to deliver SD or HDTV content. At the Tech Fair Microsoft TV displayed its IPTV Edition, which features instant channel change (ICC) and multiple picture-in-picture (PIP) for traditional TV broadcasts, VOD and DVR. With PIP a viewer can watch multiple television shows at the same time, or channel surf on smaller viewing screens while the main program plays full screen, using any standard TV display. This environment also creates a need for simple but robust home media networking. At the Tech Fair, Panasonic showed its High-Definition Power Line Communication (HD-PLC), using adapters that plug into existing power outlets. PCs and other media network devices are plugged into the adapters Ethernet ports to connect to the home network. Using 190 Mbps data speed, it is possible to enjoy multiple streams of High-Definition video, music, Internet gaming, VoIP Phone service, home security video monitoring and the typical connection of computers and other devices to a unified network. The adapter automatically sets up AES 128-bit encryption for network security. LiteScape Technologies Secure Profile Management ensures secure VoIP identity management. Of course, another involved technology is Voice-over-IP telephony (VoIP), which integrates telecommunications with Internet systems. As VoIP is adopted by corporations, they are evaluating new security issues relevant to this technology. At the Tech Fair, LiteScape Technologies demonstrated its Secure Profile Management (SPM) solution, which allows authenticated access to enterprise services for IP phone users. Identity is verified using three methods on a single device. The first method asks who the user is by using biometrics; the second asks what the user knows by use of a password; and the third asks what the user has by using a magnetic, RFID or Smart card. The SPM management system permissions to be specified for each authenticated user, regardless of location, and overall provides usage logging and auditing. SPM runs on Litescapes Mobile Application Platform (MAP) that enables real-time management of interactive sessions comprised of voice, data and image streams on a converged network. Finally, Cisco demonstrated its IP Interoperability and Collaboration System (IPICS), which enables two-way radio communication via a special server, integrating the radio links with other communication systems such as wireless or wireline voice, VoIP, video and data devices. Cisco explained how IPICS addresses a critical need in emergency management: the ability for public safety organizations and first responders to easily communicate using non-interoperable communication systems and existing networks, both wired and wireless. Using IPICS and a laptop, an emergency manager can connect to the two-way radios used by different emergency personnel, whose systems would otherwise not interoperate. In addition, the system provides gateways for wired and wireless phones (either IP-based or not) to interconnect to those radios. IPICS lets managers simultaneously monitor and communicate over multiple talk groups and radio channels. The system requires authentication via SSL, is scalable, and may be customized to include additional data sources such as sensors and video surveillance systems. Lawmakers are challenged to keep up with the moving target of accelerting technologies. They must balance innovation with consumers and industries rights and protection. These demos are a valuable way for lawmakers to understand the involved technologies and how they work. Next year ICAC Tech Fair will celebrate its tenth anniversary and will no doubt be even bigger and more highly attended.